At city hall today people lined up to urge city councillors to do even more than is covered in the city’s new climate change plan. 20 people wanted to speak to the meeting and even more wanted to witness the event. Dr. Curtis Lavoie, an emergency room physician at CHEO likened our response to climate change to how patients are seen in his hospital assuring us that the scientific consensus on climate change is far stronger than agreement by doctors in assessing an emergency patient and that the fever being experienced by the earth calls for urgent resuscitation. Randal Goodfellow, of the coordinating council of the national governing body of the Anglican Church of Canada observed that there were huge opportunities in working with faith groups; faith groups being the second largest land owners in Canada and having notoriously energy-inefficient buildings. Jon Connor spoke on behalf of the Partners for Climate Protection program of the Federation of Canadian Municipalities. As such Mr. Connor represents one of the most knowledgeable people in Canada on actions being undertaken in cities. He encouraged the city to work with the community to develop a more defined plan and an implementation framework. Several speakers including Sucha Mann representing Professional Engineers Ontario, Ottawa Chapter; and Don Anderson representing the Ottawa Chamber of Commerce, Environment Committee were unable to stay long enough to speak, the presentations went on well into the afternoon. Almost all speakers praised the city for undertaking the initiative and for the quality of the data. But almost all speakers also expressed the need for more. 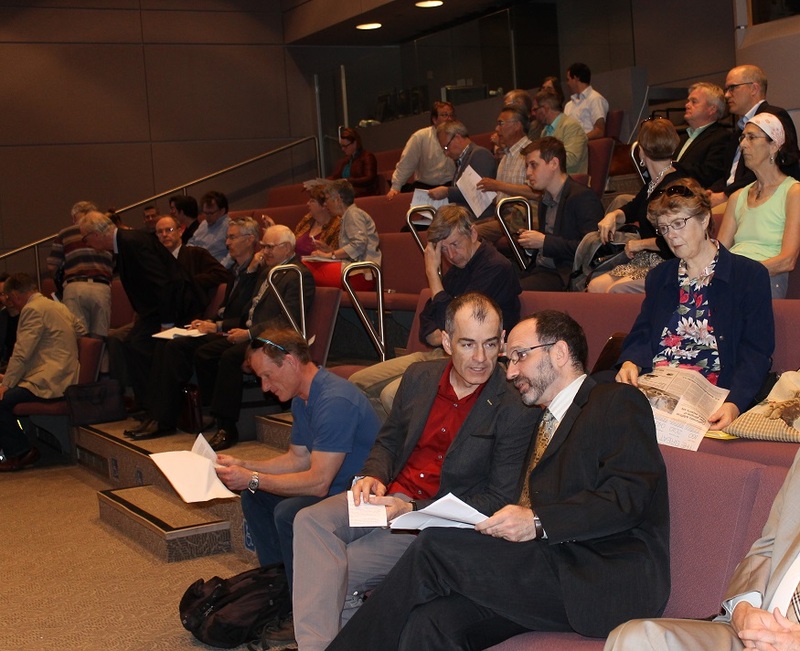 Councillor Mathieu Fleury quizzed city staff trying to ensure that the plan would ensure that unlike in the past, the greenhouse gas reduction targets of this plan would be met. Councillor Keith Egli – formerly a member of Environment Committee – returned to listen in and scrutinize the city’s plans to engage the community as partners in achieving the desired reductions. Councillor David Chernushenko wrapped up with an impassioned observation that approaching this particular problem in only a measured way with reasonable responses was to lose sight of the fact that the atmosphere is reacting to greenhouse gases without regard to what we might consider reasonable. And that getting from the current 12% reduction target to 80% (the G8 and Ontario targets) has to be seen as the necessary objective. The committee ultimately endorsed the 2014 Air Quality and Climate Change Management Plan – with Councillor Allan Hubley dissenting – and the plan will come before full City Council on May 28. The support for the plan from the community, the Mayor and the Environment Committee make it unlikely that the plan would not be approved on May 28. It is that support from the community that engendered the political support for action on climate change so it’s never too late to encourage your city councillor, saying as the meeting did today more urgency and higher targets are in order.